by Terence Mauri author of The Leader’s Mindset….. In 2017, the number of startup “unicorns”, small, fast-growing technology firms with valuations of more than $1 billion, is at record levels. The big guys know that survival requires leading differently and continually finding new ways of doing things that the competition doesn’t. This is the age of disruption where the normal rules of business just don’t apply anymore. For example, Tesla, a software company is valued higher than both Ford and GM and Amazon an e-commerce and cloud computing company won three Oscars at the annual Academy Awards for Best Films. CEOs are sweating in boardrooms up around the world as young upstarts force them to completely rethink how they run their companies. Leadership is undergoing a seismic and long-overdue shift. Unless you spend every hour of the day awake, it’s a bad strategy to try to do everything. You must know what not to do. Clear thinking helps a leader remain focused on the “critical few”. The “critical few” is another way of saying the 80/20 rule. This clever rule of thumb says that 20 percent of anything drives 80 percent of outcomes. For example, 20 percent of your leadership actions will produce 80 percent of your results. Can you think of any others? Now that you know about this, you’ll start seeing it everywhere. With limited time and resources, you must identify the critical few leadership actions that will give you the most leverage. This means thinking, acting, and leading in a way that gets results and taps into the biggest sources of potential in yourself, and your organization. There are three action-oriented mindsets you must amplify to lead in the age of disruption. They are practical shortcuts for simplifying how you think, how you act, and, ultimately, how you lead. When was the last time you set a challenge for yourself that pushed you to deliver more than you thought was humanly possible? Most leaders think about how they can lead better by 10 percent or 20 percent, not by a factor of ten. The leader’s mindset is hardwired to think bigger and brighter, whether it’s wiping out malaria in the next ten years (the Bill and Melinda Gates Foundation) or making space tourism a reality (Richard Branson and Elon Musk). These leaders have an eye on the future and can spot an unmet opportunity quickly before others. They’re not afraid of change and enjoy bucking the norm. They are future shapers. You don’t have to be a CEO or run a startup to think big. It’s about taking control of your vision rather than someone else hiring you to fulfill theirs. Get started, have a clear destination, fail fast, test ideas lightly and often, and know that those who shape the future hold two beliefs: (1) problems can’t be solved with yesterday’s thinking, and (2) you have the resources to achieve your goals. What is it that enables leaders to persevere through seemingly insurmountable challenges that at first seem to exceed our limits? Make a list of leaders you admire and who have made a difference in the world. They could be living or dead. The chances are they all have one outstanding quality in common: they are bold. A bold mindset excels at speed, creativity, and decisive action. They are risk takers. It’s not the only factor that drives success, but perhaps it is one of the most important in the age of overload. We all face the twin problems of deciding what to do and what to tune out. Creativity enables leaders to imagine different solutions to a problem and can help you “cut through the noise and focus on the signal,” as high profile entrepreneur Elon Musk describes it. If you want to make an impact, you need to act boldly, especially when the going gets tough. Adversity is a natural part of the leadership journey. I have discovered that at the core of a leader’s mindset is an attitude, rooted in an ancient Nordic belief system called sisu. Sisu refers to “extraordinary determination, courage and resoluteness in the face of extreme stress or adversity.” Every leader I have studied overcame battles that seemed insurmountable at the time and yet they did not give up. Today, business is inherently more complex than it has ever been. Yves Morieux, senior partner at strategy consultancy Boston Consulting Group (BCG), has developed an index to show how business complexity has increased sixfold during the past sixty years alone. And organisational complexity (number of procedures, structures, processes, systems, vertical layers, and decision approvals) increased by a factor of thirty-five. The truth is that most companies are still stuck in Industrial Age mindsets where efficiency is more important than change and innovation. They fight complexity with complexity. The impact on leaders is more stress, poor decision-making and loss of strategic perspective. To learn fast, you must fight complexity with simplicity and be able to cut through the noise and focus on what really matters. Reduce waste, update old processes and introduce lean principles to take ideas to action more rapidly. Science fiction is quickly becoming science fact where data is the new oil and information is the new currency. Are you ready to lead in this new reality? Terence Mauri is a JLA keynote speaker, Inc. Magazine Columnist and entrepreneur mentor. 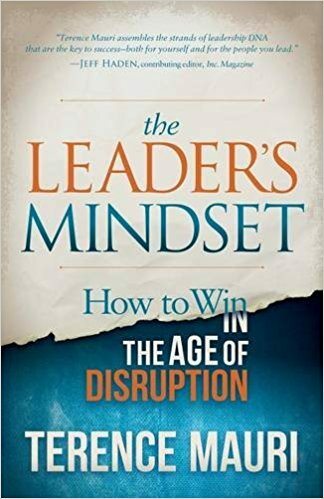 His new book The Leader’s Mindset: How To Win In The Age of Disruption is a global bestseller – described by MIT as ‘a fine read for anyone looking to take their leadership skills to the next level’.